One of the side-effects of Denmark’s improving economic robustness is the rather unwanted one of traffic queues on the way to and from work. “When companies produce more, there are more people who have to go to work, more lorries needed to transport goods, and various service functions needed around the country. All in all, that produces more traffic,” explained Andreas Egense, a traffic analyst from the Danish road directorate Vejdirektoratet, to DR’s TV program ‘Penge’. As well as the booming economy, car prices have fallen and people tend to commute longer to work. Figures from the association of Danish car importers, Danske Bilimportører, show that on November 19 there were 2,983,500 cars registered in Denmark – more cars than ever before, reports DR Nyheder. Since 2010, there has been an increase of 25 percent in the number of cars on motorways. 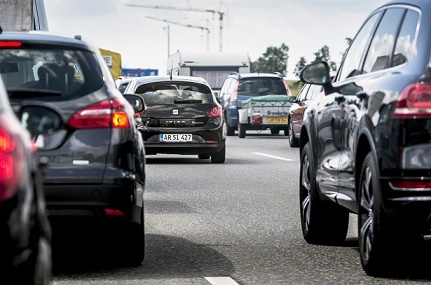 Mogens Fosgerau, a professor at the institute of transport at DTU, has been investigating how much the time spent crawling along in traffic costs society from a financial point of view. In the capital region alone it is estimated that the total amount of delays for private motorists adds up to around 30,000 hours per day. That equates to about a billion kroner’s worth of time per year. “It’s not as if you lose a billion kroner on the streets exactly, but you do lose time to the value of a billion kroner,” he explained. At the confederation of Danish Industry, Dansk Industri (DI), there is broad agreement with Fosgerau’s findings. DI estimates that delays and road congestion cost society around 20 billion kroner in 2017. And it is not only a problem in Copenhagen. “I’m sure anyone who has driven across Funen has experienced congestion, and if we look at the motorway in eastern Jutland, there is also a massive strain – especially on the stretch between Randers and Aarhus,” said Michael Svane from DI. According to Svane, more motorways should be built and there should be more investment in public transport. However, he admits that it is not possible just to ‘build your way out’ of the problem, and he suggests that the width of the lanes could be reduced on certain stretches. “So rather than having just two lanes, you could convert that to three. Combined with a reduction in speed, that would create a better traffic flow and allow it to disperse faster,” added Svane.